Thu, March 22, 2018 7:30 P.M.
With an artist’s eye and a ground-level view of people in extremis across the world, writer Anna Badkhen offers “rich and lucid prose [that] illustrates her journey as vividly as might a series of photographs” (Christian Science Monitor). Her immersive investigations of the world’s iniquities have yielded six books of nonfiction, most recently The World Is a Carpet: Four Seasons in an Afghan Village and Walking with Abel: Journeys with the Nomads of the African Savannah. A contributor to Foreign Policy, The New York Times, and The New Republic, she won the Joel R. Seldin Award for documenting the lives of civilians in warzones. In Fisherman’s Blues, Badkhen documents the cultural, economic, and environmental turmoil in a centuries-old Senegalese fishing village. 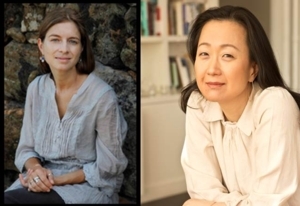 Min Jin Lee is the author of the “accomplished and engrossing” (New York Times Book Review) novel Free Food for Millionaires, a story of culture clash and identity that was named to a number of 2007’s “best of the year” lists. She is a former columnist for the Chosun Ilbo, South Korea’s leading newspaper, and her fiction, essays, and articles have appeared in The Wall Street Journal, Vogue, and Food & Wine. A National Book Award finalist and New York Times bestseller, Lee’s newest novel tells the generation-spanning story of a Korean family’s fight for purchase in 20th-century Japan.